Osaka has over 1400 years of history. Today the city deserves to be called the gate of Japan. Situated at the mouth of Yodo River and Osaka Bay, Osaka is the third largest in population city in the country of the rising sun, after Tokyo and Yokohama. Residents of the Japanese city number around 2.5 million. Historians say that Buddhism quickly made its way to Japan via Osaka, which is exactly who first met the Buddhist pilgrims. Along with spreading the new religion, the Japanese prince Shotoku, who was only 16 imposed the Buddhist faith, built over 593 years ago Shitennoji Temple in Osaka. It is considered the oldest Buddhist temple in the country. In the holy place is a beautiful lake, inhabited only by turtles, which symbolizes the Buddhist paradise. The entrance fee to visit the temple is between 200 and 300 yen (2-3 euros). The building quickly became a religious, cultural and commercial center of Japan. 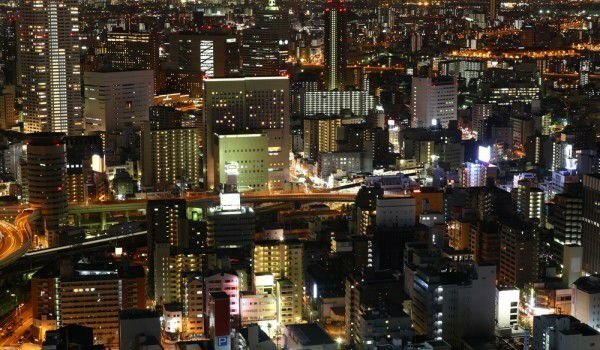 Not without thanks to Shitennoji, the 645 years old Osaka, then known by the name Naniva, became a magnificent capital of the country of the rising sun. Osaka has well preserved ruins of temples built before the era of Buddhism. One of the oldest temples in Japan, called by locals Sumiyoshi Taisha, presents the ancient Japanese architectural style, unaffected by the new religion that gripped the country during the V century. Osaka modern culture finds its embodiment in a number of attractive buildings and monuments, impressive residences and tourists. In Osaka is one of the largest in the world Aquariums. The massive construction has 16 large chambers in which representatives of the Pacific water world swim free. In the aquarium in Osaka, you can find the only shark that is kept in an aquarium. Commercial buildings have constructed a dynamic landscape of the industrial part of town. Among them, the skyscraper Umeda, this consists of two separate buildings, connected by many escalators. Thanks to interesting architecture thought its execution, Umeda skyscraper was officially declared the building, which houses the longest escalator. Fans of the long shopping trips can also find their place here. 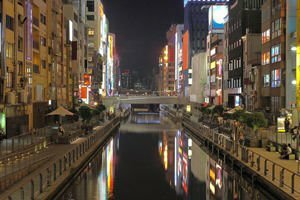 There are two main shopping areas - Minami, located in the southern part of town, and Kita, in the northern part of Osaka. The former Japanese capital is proud with its museums, the most interesting among them are the Museum of Wine, Museum of Oriental Ceramics, Museum of Modern Art, Museum of Modern Science, History Museum and the Osaka City Museum of Art. One hour from Osaka is another interesting Japanese city - Nara, in that complex are among the most ancient and impressive Japanese temples. Close to Osaka is located Kobe. The city is famous for its huge shopping centers, located near the water. The port city in 1995 was violently shaken by a powerful earthquake that took more than 5000 victims. Today the city is completely rebuilt and almost no traces of the devastating earthquake are left in Kobe.